What does it take to be the best? In the Hamptons and on the North Fork, it takes a particular dedication to excellence, a desire to deliver the best of everything to a discerning group of residents and visitors alike who love the East End. Dan’s Papers has always celebrated the best the Hamptons and the North Fork have to offer, and nowhere is that celebration bigger than in the Dan’s Best of the Best competition. 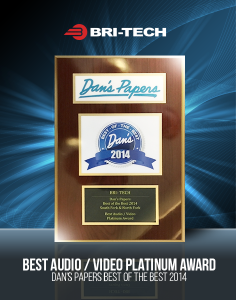 Bri-Tech is proud to receive the Dan’s Papers Best of The Best Platinum award for Audio/Video. Media Synch, a newly released technology from home media pioneers, Bri-Tech, ensures that no matter which room you’re in, the media will follow, seamlessly. 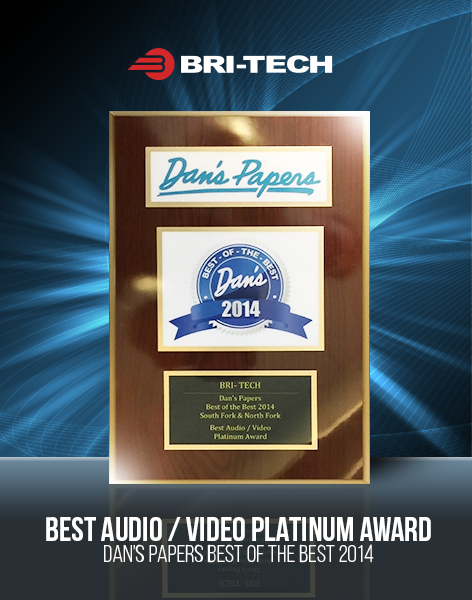 Long Island based home media design pioneers, Bri-Tech, take pride in perfecting the often overlooked details in home entertainment. Perfect sound balance, effortless control, and carefully crafted lighting that sets the mood at the touch of a button. The newest addition to their suite of home automation tech products is Media Sync. “It’s the small things,” says Brian McAuliff Senior Designer for Bri-Tech Inc. “They make a big impact on the way we experience entertainment in our homes. Media Sync enables users to go from room to room in their homes, and never encounter the media lag that causes televisions tuned to the same channel to display shows out of sync, causing an “echo” effect between rooms. When you imagine living in luxury, an in-home cinema system often tops the list of “must have” items. But who has the space to dedicate a quarter of their home to a theatre? Maybe you’ve even considered ditching the living room for a theatre, but quickly dismissed the idea as too outrageous. The good news is, you don’t need more than a spare bedroom, or furnished basement get the experience of a world class theatre right in your own home. Couple’s theaters are rapidly becoming the “must have,” splurge for empty nesters and new retirees. They offer a bit of cinematic paradise nestled perfectly in little Johnny’s former room, or in that finished basement that doesn’t get enough use with the kids out of the house. These home theaters are perfectly tailored to your taste, and are relatively quick to install in most homes. There are three major changes in clients’ requests for home theater and all around higher performing spaces: Clients are interested in performance and not just a cool looking room. Acoustics: Clients have been asking that designs included acoustical design which is more than just some simple panels. These include bass diffusers and dispersion elements hidden behind stretched fabric. The room is designed in 3D and then analyzed to determine speaker placement and sound control elements. Afterwards microphones are placed in the room to digitally calibrate. Symbiant HD, a revolutionary home-automation module from Bri-Tech, capable of being completely hidden within a narrow wall, will make it’s debut November, 2014. A leader in home automation technology, Symbiant, a subsidiary of Bri-Tech, will soon release the newest addition to high tech, high-rise living, Symbiant HD. The Symbiant HD (Symbiant High Density Home Automation System) is a full function home automation system, specifically designed for penthouse living, and other high-end dwellings where space is at a premium. Able to be completely hidden within an 8” wall, the Symbiant HD module offers minimal space loss, with maximal features, making it the go-to solution for architects and builders looking to get maximum ROI per square foot of living space. Symbiant HD units can also be installed into existing homes. Included in the system are features including security, lighting, sound, privacy and climate control, all at the touch of a button. Smart phone integration and one touch control is standard, making the system an integral part of any smart home or penthouse. iOs 8 may be the biggest iOs to date, and while new features seem like a good reason to upgrade, there are also some very compelling reasons to exercise restraint. Before you jump head first into an iOs upsdate, make sure all your important data is backed up! Take your time and go through your entire phone, especially if you have photos, text messages, financial information and other documents that you can’t afford to lose. Don’t rush into updates which may put your data at risk. Did you know that lighting can affect your mood and behavior? Multiple studies have been conducted on the subject of mood and lighting and many have concluded that the color and intensity of light does in fact affect us in several different ways including our physical health. For example, poor lighting can make us feel depressed or ill. Also Poor natural lighting can trigger depression and actually has a negative effect on our immune systems. Bright artificial lighting or lighting that causes rooms to appear overly bright, makes us to feel nervous and on edge in the space. Ever notice how fast food restaurants are really bright? It is because you are more likely to eat quickly and leave. Insufficient lighting can cause us to suffer emotional stress and even physical illness if we are exposed for long periods of time. Natural lighting through windows and skylights has calming effects on our minds and emotions. Not only does the brightness of light affect us, but the color of light does too. We are Proud to introduce our new Core Elements! The foundation of the best Automation System In the World! Call us for more info! AirPlay lets you wirelessly stream what’s on your iPhone or Android via Symbiant Control System. We are proud to introduce The Symbiant Automated Interior Door System. The new Symbiant Automated door system is a sliding entrance system powered by magnetic drive technology. It is very quite and safe when it operates and ideal for interior applications. The Symbiant Automated Interior door is controlled by a box that can be integrated into a Symbiant Automation System. Our president, Brian McAuliff, was recently interviewed by LI Pulse Magazine to shed some insight on home security, as well as other advancements in the technology industry. If you’d like to read the published article, click here! Or, if you want to read the full uncut interview, see all of his answers below! 1. What are some of the best advances in home security you have seen over the last year? Thanks to our latest interface design, it is now easier than ever to operate your system. Unlike our competitors’ systems that leave you in a state of confusion because of their complexity and plethora of buttons, our interface design makes it painless to operate your system. Baby, it’s cold outside! So cuddle up and stay warm this holiday season in an Immersa Home Theater by Bri-Tech. Does your basement need a makeover? Is that extra bedroom just taking up space? Why not convert unused space into a private home theater? Let us plan, design, and install a custom Immersa home theater to give you the ultimate cinematic experience. Fall in Love With Cinema Again- Flat screen panels are all the rage, but projector based systems can bring back that romantic, intimate feeling to the movie-watching experience. Your custom designed Immersa theater can become your place to go away to in your own home.